Welcome to "The End of the World." Noah Solloway has escaped the city with his family to his in-laws' estate in eastern Long Island. He's joined by his loving wife, Helen, and their four precocious children. At the same time, local Montauk waitress Alison Lockhart struggles with her husband, Cole, to move past a recent tragedy. In a chance encounter, Noah and Alison meet and connect. But in this bucolic beach town, it's impossible to avoid someone you yearn to see again. Series premiere. This show is definitely interesting. Really not sure where it is going to go. - Why are they being interviewed? Is it a really a murder mystery, or a tale of the affair? - How did Alison and Cole lose their child? Is one more "at fault?" - Is either person still married? Are Noah and Alison together? Also, the big selling point of this show is the "both sides/Rashomon" angle. Alison seemed way too perfect, way too seductive in Noah's version. Is his telling not to be trusted? Or, is Alison ashamed that the way she dealt with the loss of her child was to have an affair, so she made herself a passive participant? I really have to wonder about Noah--the outfits Alison is wearing in his retelling! No working waitress would wear a skirt that short (in her version, it's knee-length). I mean, obviously both are unreliable/making themselves look good, but so far I trust Alison much more. Also, how great is Noah's family life if one of his kids is pretending to hang himself? I guess I'm also not super interested in yet another failing white guy writer character ("I'm a teacher! I'm so noble!") cheating on his wife. Wow, didn't notice the shorter skirt. However, I did notice how different the retelling of the choking was between the two stories. In Noah's version, he saved her after his wife noticed her choking. Alison is off in the distance. Noah bumped into her in the bathroom by chance when looking for his son. Alison's version has her much more of an active participant, with her noticing she's choking, and her striking the child's back to free the marble. Noah follows her to the bathroom, and Noah is grateful and not sure how to thank her. He even strangely offers her money, which might be a shadow of a class tone that this show might take as well. How she reacts must be related to how her child dies. Really strange to have the differences. Not sure if it is intentional or just showing how faulty memory is years after the fact. Oh, and is it strange to say I'm interested to see how he pulls off an affair when he has no really good cover? He has no private house, she has a husband, he doesn't have a job where he can disappear for hours. I guess he'll be going to "the gym" a lot? 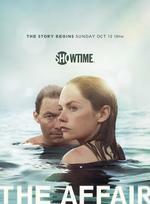 Also, can I just say, Ruth Wilson is doing an amazing job here. I love the difference in her portrayals of pouty waitress in his version vs her actual self as a grieving wife. I really want to see more of Joshua Jackson and Maura Tierney's characters, too. For the moment, I'm assuming the differences are faulty memory -- probably the waitress outfit is more correct in Alison's version, but she also looked more attractive than she thought she did. I can't imagine what the reality could be in the choking story.